The Queen Mary, the most luxurious ocean liner of her time, built during the Great Depression, made her first transatlantic voyage in 1936. Although she started out as an ocean liner, it wasn’t long before she was called to serve her country by carrying soldiers in WWII and was transformed into the Grey Ghost in 1939. After the war she went on serving passengers for 20 more years, before docking for the final time in 1967 in Long Beach, California, where she still sits today. 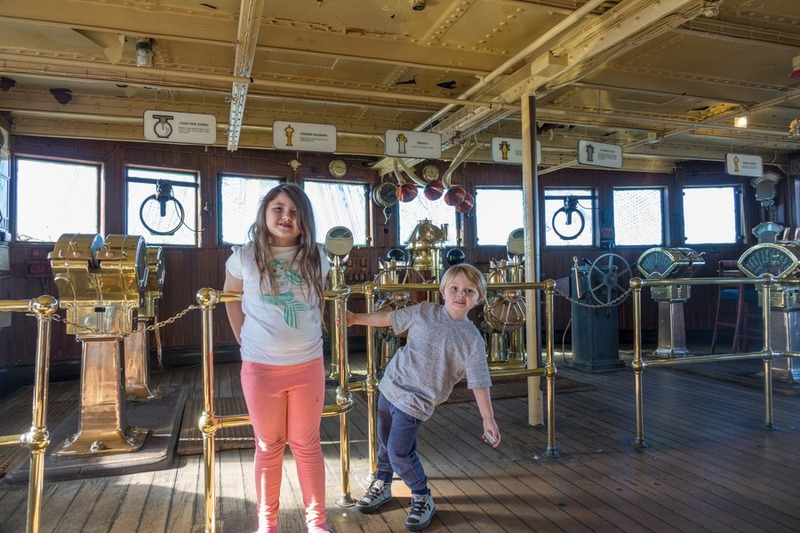 Now, families come to visit, stay and play on this historic vessel. The Queen Mary is a historic floating hotel and staying aboard is quite a treat. Restored to its former glory, guests can drift off to sleep in one of the art deco staterooms from another time. For my last trip, I used TripAdvisor to book our room, because it reliably finds the best deals and directs me to the right hotel booking site. Plus those reviews gave me great assurance that I was making the right choice. Once you are onboard, here are some things you can’t miss! 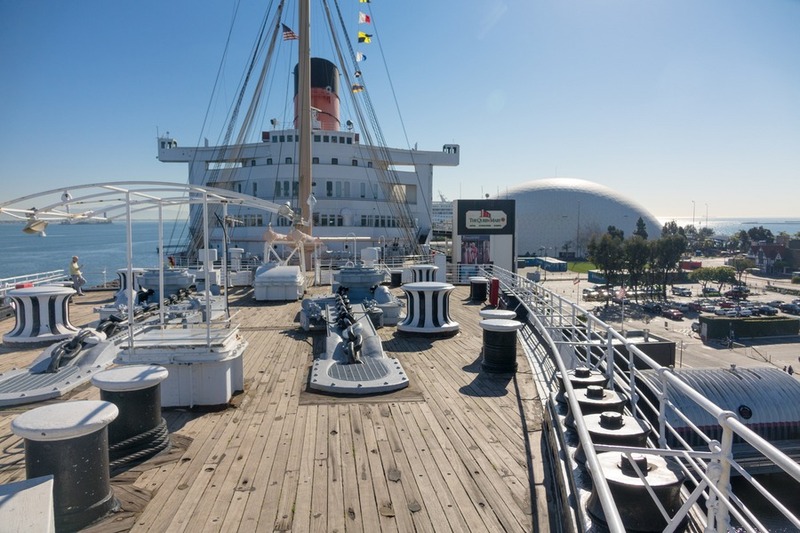 Queen Mary offers a variety of tours and exhibits to learn about the ship. For instance, Diana: Legacy of a Princess is the newest exhibit, which replaced the Titanic exhibit. My favourite is the Haunted Encounters tour, because guests get to discover for themselves why Queen Mary is considered in the top 10 most haunted places in America. 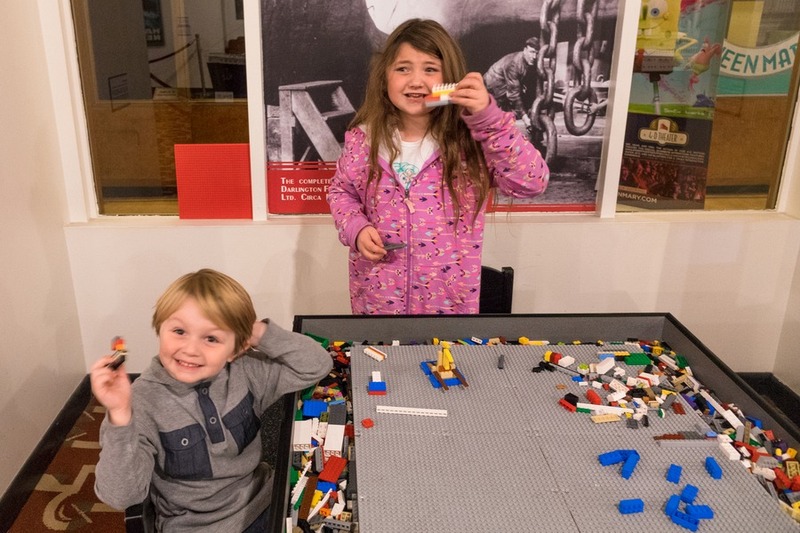 The kids really enjoy the Shipyard exhibit, where scaled replica of the ship is made out of LEGO! Also in the room are three LEGO tables for the kids to create their own nautical vessels. I’m not going lie, it was hard to get my kids to leave this room. The Model Gallery is also pretty awesome. Displaying the finest ship models, the gallery shares the history of transatlantic cruise ships from the 1840s to present day. Next to the Queen Mary is the Russian submarine, Scorpion, which remains unchanged since the Cold War. I could go on forever, but check out the Tours and Exhibits desk on-board to find the one that suits your fancy. 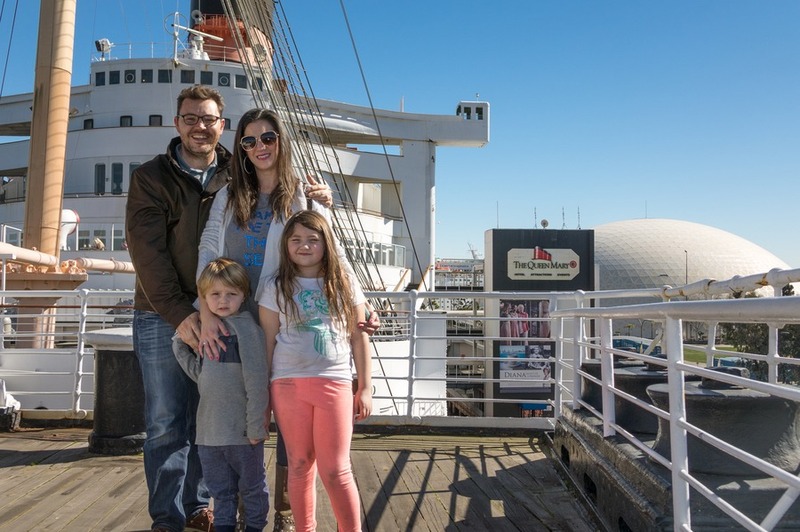 In addition to the tours and exhibits, there is always a fun event being hosted at the Queen Mary. My favourite is the Scots Festival, held every February. There are tons of fun activities for families, the sound of bagpipes fill the air, and beer is flowing freely. It is a great time! Another event that I love is the Shipwreck during Halloween. There are haunted houses, live music, bars and an extra level of spookiness due to the real ghosts that might be wondering around. During the end-of-year holidays, kids will love CHILL. This frozen event includes, ice-skating, ice tubing, sleigh rides, Santa, and an annually themed interactive winter wonderland. It is a great event for families. And I know the Bender family visited in December to take part in CHILL. Honestly, you do not need a tour or event to enjoy your time on The Queen Mary. My kids loved to explore on their own, wandering around the old promenades and hanging out at the bow of the ship. There are audio tours available if you’d like to learn about different areas of the ship as you explore at your own pace. 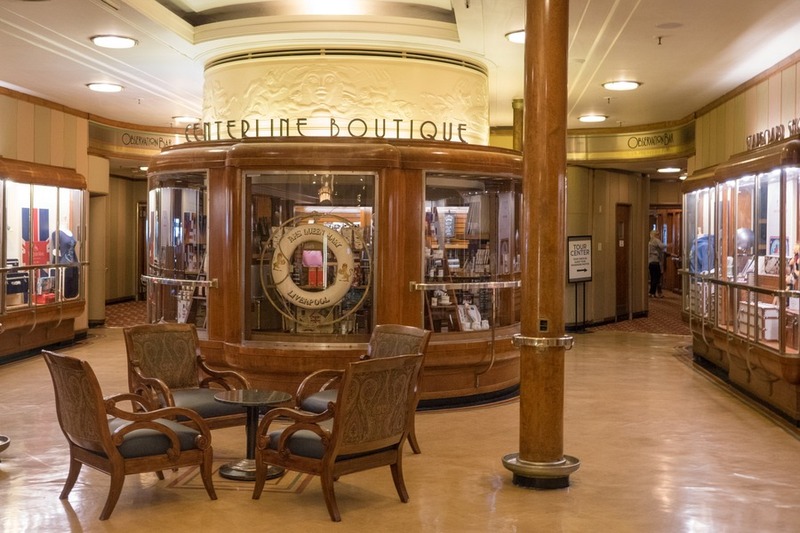 As soon as you step onboard The Queen Mary, you’ll step back in time. Touch the railings, smell the old wood, and absorb the wonder. With so many fun things to do with kids, you could spend a whole weekend trying to do it all. If you ever find yourself in Long Beach, California be sure to check out this magnificent ship. This post brought to you by TripAdvisor. The content and opinions expressed below are our own. Loved the lego model, kids will surely like it a lot. My husband and I went before we had kids and loved it. I had almost forgotten about it until I read this post. We "got lost" through parts of the ship that tourists don't normally get to see. We ended up stumbling into the employee break room and hearing some of the crazy, haunted stories. It was spooky and exciting. We'll definitely be taking our kids next time we are in Southern California. Thanks for the reminder!